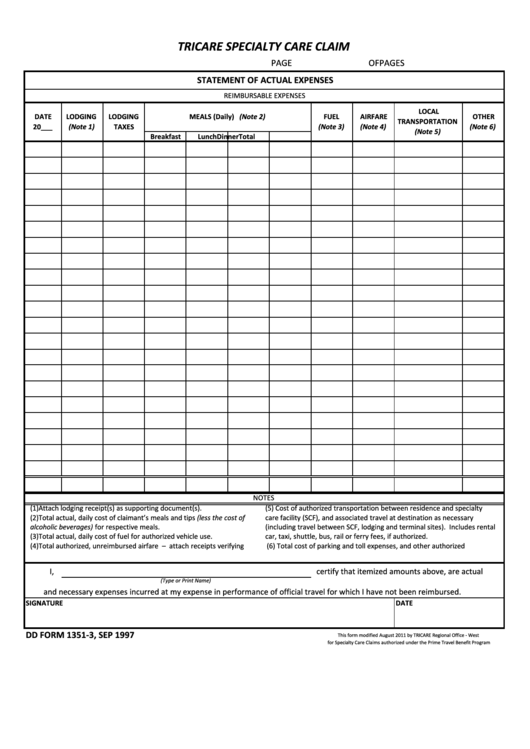 Download a blank fillable Dd Form 1351-3, Tricare Specialty Care Claim in PDF format just by clicking the "DOWNLOAD PDF" button. Complete Dd Form 1351-3, Tricare Specialty Care Claim with your personal data - all interactive fields are highlighted in places where you should type, access drop-down lists or select multiple-choice options. (1)Attach lodging receipt(s) as supporting document(s). alcoholic beverages) for respective meals. (3)Total actual, daily cost of fuel for authorized vehicle use. car, taxi, shuttle, bus, rail or ferry fees, if authorized. and necessary expenses incurred at my expense in performance of official travel for which I have not been reimbursed.